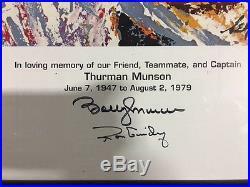 Thurman Munson Day Leroy Neiman Print Signed By 7 New York Yankees Players. 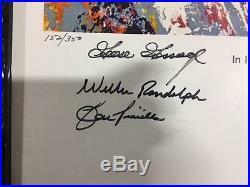 Hand Signed by Leroy Neiman D. 2012, Graig Nettles, Sparky Lyle, Goose Gossage, Willie Randolph, Ron Guidry, Lou Pinella and Bobby Murcer d.
2008 The first 350 were numbered and signed by Leroy Neiman. This is number 152 out of only 350 pieces. Framed and ready to hang, measured 41" x 28". 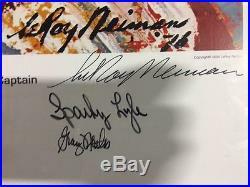 Leroy Neiman's prints are highly collectible pieces of art, and a great investment! A must for any New York Yankee Fan. 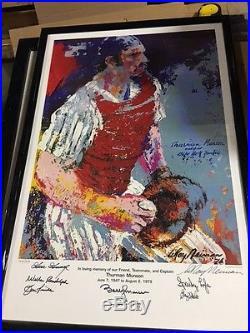 The item "Thurman Munson Day Leroy Neiman Print Signed By 7 New York Yankees Players RARE" is in sale since Tuesday, November 22, 2016. This item is in the category "Sports Mem, Cards & Fan Shop\Fan Apparel & Souvenirs\Baseball-MLB". The seller is "sportsillustrateds" and is located in Simi Valley, California. This item can be shipped to United States.